The chilly air of fall is perfect for hearty soups. 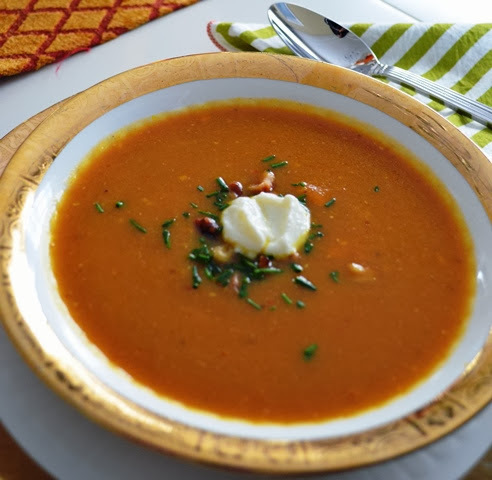 Some of my favorites are butternut squash and pumpkin soup which are in abundance in the fall/winter season. The cold just makes me want to linger in the kitchen chopping, baking and cooking while listening to music, possibly with a glass of Moscato to keep things even happier. This particular recipe is one of the easiest ones yet - simply because the oven and the immersion blender does all the work for you. I believe that soup is the best first recipe to try out if you're one that's not much of a cooking person, because I know once your first batch comes out great, it will give you the confidence that you need to try making something else. Wash and cut the pumpkins in half. Poke holes with a fork in pumpkins before baking. Brush the flesh of the pumpkins with 1 tbsp melted butter and season with 1 tbsp salt and 1 tsp white pepper. Lay the pumpkins, flesh side up on a baking sheet. Roast them at 350 degrees for 1 hour until the flesh is nice and soft. In stock pot over medium heat, melt 2 tbsp. butter. Add onion, apples and garlic; cook, stirring occasionally until softened, about 10 minutes. Scoop the flesh of your pumpkins from the skin into the pot and add the broth 1 1/2 cups water, bay leaf, coriander, salt and red pepper flakes. Bring to a simmer; reduce heat to medium-low. Simmer for 30 minutes. Turn off the heat; discard bay leaf. Using an immersion blender, puree soup in pot until smooth. Stir in cream and turn the heat back on. Cook over medium heat until heated through, for about 4 more minutes. Once your soup is done: ladle into bowls, garnish with 1 tbsp of creme fraiche, sprinkle with fresh chopped chives and finish with a pinch of your toasted chestnuts or walnuts. *If you can't find chestnuts, you can always substitute for toasted walnuts chopped.